Adventures with Ole | Crockett Foundation - Tag In & Help Out! Growing up as a Crockett meant you were surrounded by professional athletes and that they shaped you in many ways and as I sit here now writing this, I honestly can’t think of one negative way it affected me, my brothers and sisters or my cousins. The athletes, whether wrestlers, baseball players, or hockey players, were a shining examples of hard work, discipline and what it takes to achieve your dream. Every once in a while an athlete would come along and would teach you something that would serve you equally as well in life and that was how to be quick. My shining example of that is Ole Anderson. Let me explain what I mean by quick. In Ole’s case, it not only meant fast on your feet it meant mentally quick. Every conversation was a duel to the death. Nothing went unnoticed and something was always going to be said. For example, walking through the Jim Crockett Promotions office with a box of baseballs, Ole looking me directly in the eye and asking, with a look in his eye that I can only imagine is the same look that a lion has when a gazelle runs across its path, “What’s in the box?” Now I completely understand that the safe move would have been to say “baseballs” and walk away but what fun would that be? You see Ole’s goal in these short interactions was to get a reaction and my goal was not to react. With that in mind, the only answer I could come up with was “balls” as I looked into his eyes with a steely gaze. As I am sure you can imagine, that conversation went downhill quick but Ole did not win and I did not react. Everyone knows that Ole is tough as nails, come on now, he’s been stabbed 7 times and boast about it. He does everything full throttle. There is a very little known story about Ole getting a speeding ticket in Charlotte, NC. He came into the Jim Crockett Promotions office mad as hell about this ticket. He was being unfairly charged and he was going to fight it himself in court. Everyone in the office that day told him just to pay the ticket and move on but nooooooooooo that would not be Ole Anderson’s way of handling this type of situation. Several weeks later Ole’s court date arrived. My dad, John Ringley, put me in the car so we could go watch the next Clarence Darrow fight the injustice that was being dispensed upon Ole Anderson by the city of Charlotte. For those of you that have never been to traffic court, it is a revolving door of cases. Fast and furious. In and out. When Ole’s case was called he explained to the judge that he was in fact not guilty and that he would explain to the court why. The judge pointed to a blackboard on wheels that was to Ole’s left. The judge told him to draw his explanation on the board so that he would have a better grasp of what Ole was going to try to explain. With a level of confidence that was envied by everyone in the courtroom that day, Ole sauntered over to the black board, turned it away from everyone and began to draw. For thirty minutes, all you could see was Ole’s legs from the knees down walking back and forth behind the board. Ole was finally done with his master piece and came around from the board. Head and shoulders back, chest puffed out, he motioned to the judge that he was done. The judge asked him to turn the board back towards the bench. Ole was confident as he turned the board slowly towards the judge and once he had it fully in view of the courtroom, he stood there defiantly as the judge gave the drawing a quick glance. Guilty the judge said with quick rap of his gavel. Yes…I laughed. Yes…my dad laughed. In fact that was all you could hear in the courtroom as Ole stood there in silence and defeat before he went to pay his fine and court cost. I think the reason I remember that so vividly from so long ago is because Ole Anderson was just being Ole Anderson and somehow I have always found humor in that. 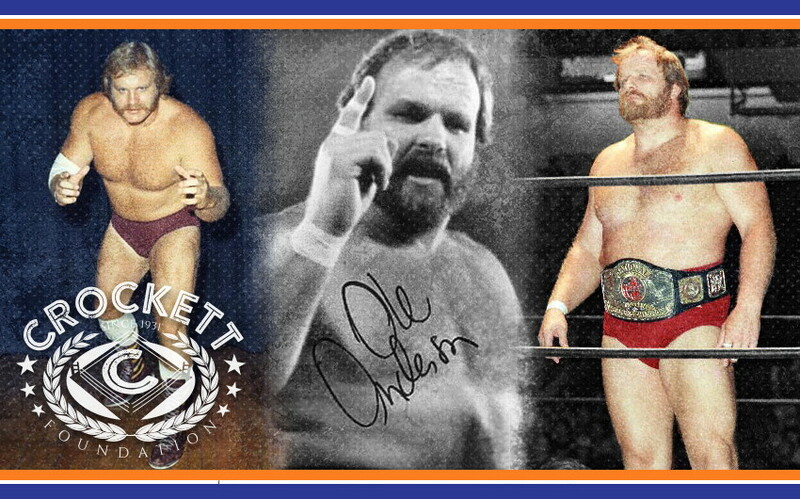 I will always love Ole Anderson for no other reason than, by God, he is Ole Anderson. He taught me how to get out of the way when someone is ramming someone’s head towards you at a wrestling match. He taught me how to look a challenge directly in the eye and step up to that challenge and he showed me that the fix is in so just pay the damn ticket.